A student decided to take the financial burden off his parents and to pay his own way through university – by dealing drugs on the streets of Leamington. Now Coventry University student Gerry Tito has had to listen to another lecture – from the Warwick Crown Court judge who jailed him for a total of three years and three months. Tito, 20, from Hendon in North London, had pleaded guilty to possessing the class A drugs heroin, cocaine and crack cocaine with intent to supply them. He also admitted possessing ecstasy, also a class A drug, for his own use, possessing an offensive weapon, a flick knife, and possessing criminal property. 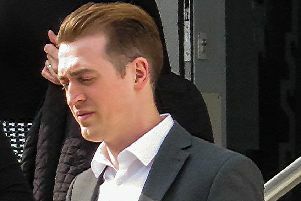 He was arrested in Leamington on May 28 and found to have been in possesion of two packages Lara McDonnell, defending, argued that a conclusion in a pre-sentence report provided an ambit in which the judge could depart from sentencing guidelines and impose a suspended sentence. “He was only dealing for some two months. “The purpose was so that he could fund his studies and take the financial burden off his parents. “He is highly remorseful for what he’s done. “He comes from a very good family who support him. “To send this person away and put him behind bars would be a very sad day for someone like him. But, having said he could not give a suspended sentence to Tito and jailing him, Recorder Hegarty told him: “You were brought up to be an entirely decent individual, and you led a decent industrious life. “But you then came to Coventry and were tempted to raise money, not by getting a job as you had done before, but by getting involved in criminal activity. “You had been dealing in class A drugs for a number of weeks and had amassed a stash of cash of £5,700. “While you may have engaged in this simply to tide you over, you became accustomed to it and continued to peddle the poisons you were selling on the streets of Leamington.